That’s what Zinner&Co. marketing director Susan Licate told me when she asked me to design their ad for Crains Cleveland Business. 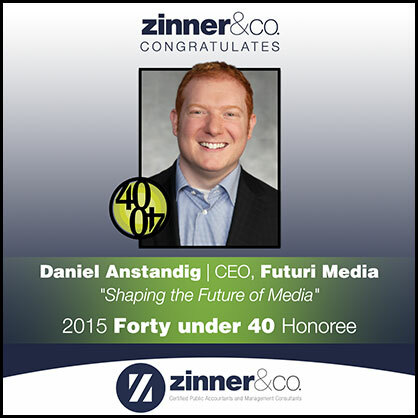 The ad celebrates Daniel Anstandig of Futuri Media as Forty Under 40 Honoree. What makes a successful magazine ad? For a company that offers accounting services primarily, it’s important to do a “less is more” approach. Stripping down the text to only the bare essentials is very important. Then contrasting the text, whether it be big vs small, or, in this case, bold vs light, is key. Also, putting their highlight lime green color against their dark blue corporate color makes that part of the ad pop off the page. And the fact that we have so much uncluttered border area on both sides keeps it from getting lost in the sea of verbiage that is a magazine page. To see a full page ad design <<< go here.